One of the world’s rarest oils, argan oil is derived from the Argan Tree. Rich in essential fatty acids, Omega 6 and Vitamin E, it is valued for its ability to regenerate and nourish dry and damaged hair. One ‘n Only Argan Oil is a premium finishing, smoothing and conditioning product. This non-greasy, alcohol-free formula instantly absorbed into the hair, creating brilliant shine without leaving an oily residue. Smooths cuticle for the silky, conditioned and healthy looking hair. This precious oil eliminates frizz and leaves hair more manageable while helping to protect against damage caused by the environment, chemicals or excessive heat from styling irons and dryers. Provides UV protection and long-term conditioning while reducing split ends and breakage. Ideal for all hair types. 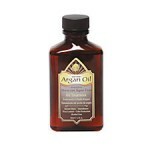 One ‘n Only Argan Oil reduces drying time and speeds up styling time producing consistently silky smooth results.